We can’t just be fit and pretty, we have to do something! Arriving at the base of the mountain equipped to climb it is half the challenge! 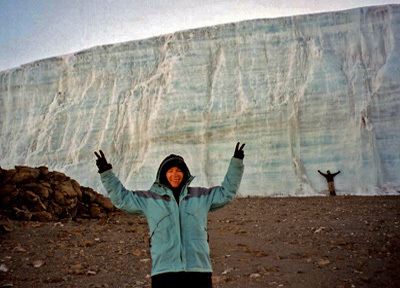 in 1976, with the soon to be successful American Bicentennial Everest Expedition. Your physical, mental, and spiritual preparations for an ascent are as important as your actions during the ascent. Additionally, your choice of season, route, companions, and logistical support are vital to the success of any mountain adventure. There are many fine climbing schools that will ‘teach’ you a skill set, and there are many guide services that offer to ‘take’ you to a summit. I believe that skills must be ‘learned,’ and that really learning a mountain craft takes time, patience, and practice beyond what any school can offer. I also believe that one must ‘earn’ a summit, and that it is each individual climber’s responsibility to accept that talisman. School or no school, guide or no guide, it is ultimately your legs, lungs and spirit that take you up there. If you want to go beyond basic services, and become more self-reliant in the mountains, my custom coaching programs can help. After communicating with you so that I can understand your desires, strengths and weaknesses, and after arranging an agenda, I will create a custom program for you that is tailored to your specific mountaineering goals, abilities, and needs. Then, I will communicate with you through the term of your program to give you the best chance of success in your adventure. Gerry became the first person to climb the ten highest peaks in North America in May of 2000 with his ascent of 18,008-foot Mount Saint Elias, considered by many to be the toughest high peak in North America. I’ve never seen a good climber who wasn’t stronger than heck! I didn’t know if I was going to the summit, or the summit was coming to me. Hiking is the basis for all mountaineering. Rock climbing is the basis for all technical mountaineering. In your storm years, visit the great glaciated ranges! can put you on an entirely different route lower down! We can climb anything if we’re comfortable enough! The McKinley River crossing was the hardest part of our Denali climb! Flow like water going uphill! With another camp, I could have climbed to 31,000 feet! It was mostly an exercise in high-altitude camping. 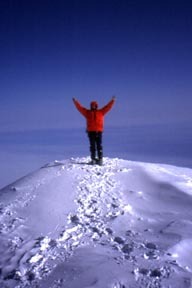 A summit is not an idea, a crater rim or an area. It is a single, well-defined point. The summit is only halfway! It was like squeezing through a closing door! we just need to pull together for this one common goal! What? We have to pay duty on our shipment? Camp 2, this is Camp 4. Hey! The stoves that were supposed to be here are gone! Gerry Roach, 1317 S. Mesa Ave., Montrose, CO 81401. After reviewing this information, I will communicate with you so that each of us can determine if one of my coaching programs is right for you. I will only accept you as a client if I feel that I can help you achieve your dreams and goals. There is no fee for this initial consultation. After I agree to coach you, then I will set up your custom program according to the following terms and choices. The choices I offer will help you be involved in your own program customization. My minimum coaching term is 12 weeks (3 months), but an initial term can also be 24 weeks (6 months) or 52 weeks (12 months). These terms can all be extended. For each term, you can choose up to 10 Empowerments from the above list. I will set up your custom program, discuss it with you, and fine-tune it to best suit your needs. 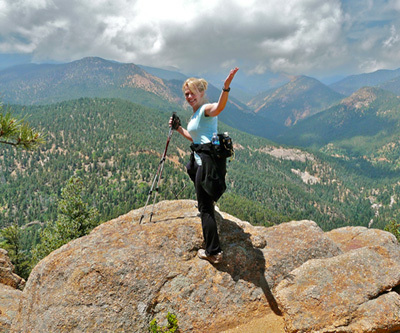 Your goal may be as simple as climbing a Colorado Fourteener, or as complex as doing the Seven Summits. Your program might be as simple as my offering advice on your existing workout program, or it might be as complex as a new physical lifestyle. Our initial conversations are included in the program-setup phase. After you embark on your program, I will be available for periodic verification communications. At each verification, I will need a status report from you, and will respond with ideas and advice. My preferred method of communication is by email. At the end of each term, or prior to your heading out on your adventure, there will be a wrap-up communication to put the finishing touches on your training, and to review events that will occur on your trip, during which time I most likely not be able to communicate with you directly. Early in 2010, I planned to join a myriad of others who had gone before me and attempt to climb my first Fourteener. I knew that mountain climbing involved certain risks and could be a dangerous activity. My state of Colorado witnesses several climbing fatalities each year, and I was not interested in becoming a statistic, so I gave careful thought to planning and preparing for this journey. The first thing I considered in my planning was to find someone who could assist me in my venture. I knew nothing about climbing a mountain and I needed someone who ‘had been there, done that.’ I searched the internet and initially found a good book to read called Colorado’s Fourteeners – From Hikes to Climbs by Gerry Roach. After perusing the book, I found Gerry’s website and signed up for his personal coaching. I was extremely impressed with his quick response. Coach Roach quickly developed a plan specifically for my goals. He worked through about six of his Empowerments during the course of my training which he conformed to the areas of my greatest weaknesses and challenges. His inspiration and direction encouraged me physically, emotionally, mentally, and spiritually. One of the most profound things I took away from this experience was the opportunity to ponder life and what it meant to me. When life presents itself with mountainous challenges – I learned from God’s Word that there is no better time than the present to make our ascent. As we reach the summit of our ‘mountain’ and experience victory – we become a walking, talking, everyday testimony of what an extraordinary God can do in the life of ordinary people. For me, this was and is my ultimate goal in life. Give Careful Thought to Your Ways – Turn ‘poor judgments’ into good ones. Coach directed me in diet and exercise. Be Strong – Turn ‘inadequate physical conditioning’ into a renewed commitment to work hard. Coach encouraged and taught on the special techniques of hiking, striding, pacing, ascending, and descending. Do Not Fear – Turn ‘improper equipment’ into the right tools. Coach’s instruction on the use of walking poles, and going over my equipment needed for the climb was invaluable. Thank you Coach for giving me the gift of confidence that helped me reach the summit and experience the victory I was searching for. June 25, 2010 – Victory! In 2002, Gerry Roach, aka Coach Roach, invited me to accompany him on a trip to Tanzania. I was going to fulfill a childhood dream of seeing the big African animals, and Gerry was fulfilling a promise he’d made to me in 1984. “First we climb. Then we’ll see the animals,” said Gerry. Specifically, we would climb 14,980-foot Mt. Meru and 19,340-foot Kilimanjaro. Yikes! 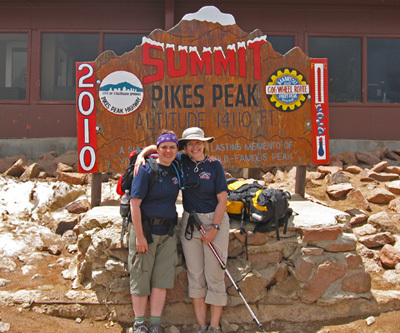 I had seven weeks to prepare and had never even climbed a Colorado Fourteener! I was a 44 year-old skier and golfer. My mind raced – start climbing and get geared. With Gerry’s help, I climbed every free moment I had and acquired the necessary gear (I didn’t even own a sleeping bag). Early on, my mantra became, “Eat what Gerry eats, sleep when Gerry sleeps, and climb when Gerry climbs.” Following world-class climbers was at first intimidating, but with Gerry’s support and encouragement, I quickly found my own pace and managed my own abilities. On Kilimanjaro, hunkered down in a fierce storm at 17,000 feet, I had the single-most clarifying moment of solitude I’d ever experienced. It’s still with me today. 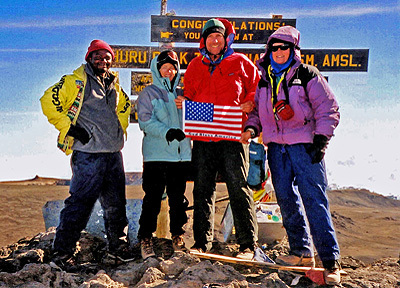 Summiting Kilimanjaro felt triumphant, and changed the way I view life’s obstacles. I am grateful to Gerry for presenting me with this challenge and being my friend and guide. Thank you, Gerry. 8:30 am October 9, 2002 – Victory! To initiate our communication, please fill out this questionnaire. What is your fitness level? None Poor Modest Good Great! What are your mountaineering dreams and goals? Have you already scheduled a climb? If so what and when?